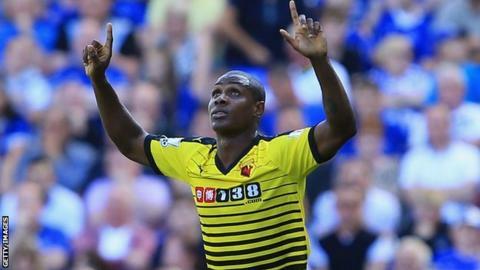 Watford striker Odion Ighalo says he will get even better after scoring a goal on his Premier League debut in Saturday's 2-2 daw at Everton. The Nigerian, 25, helped Watford win promotion last season and is thrilled to be in the top flight. "Scoring my first Premier League goal was one of the moments I had waited for all my life," he told BBC Sport. "I can do even better as long as I keep keep working hard, and I think my goal is the first of many to come." Ighalo's 83rd-minute-strike his put his side 2-1 up at Goodison Park and although Arouna Kone's equaliser prevented it from being the wining goal, the 25-year-old is delighted with his first taste of life in the Premier League. "When I was in Nigeria I used to watch the Premier League and hope one day I would play there," he said. "Even though I started the match on the substitutes' bench I was so happy, but when I came on and scored a goal in a game like that against a good side it was such a joy. "I have played and scored in the Italian league and the Spanish league. It's great that I've now done it in England. "As a striker, when you are scoring you gain more confidence. I will keep my head up and keep learning every day so I can do the best for myself and for the team." The opening-day point has also boosted Ighalo's confidence that the Hornets can avoid relegation this season. "It is not going to be easy. We need to keep pushing game by game. But I think we have a team that can stay up," he said. "We have to focus on each game, fight hard and get as many points as we can and then we can survive the drop."